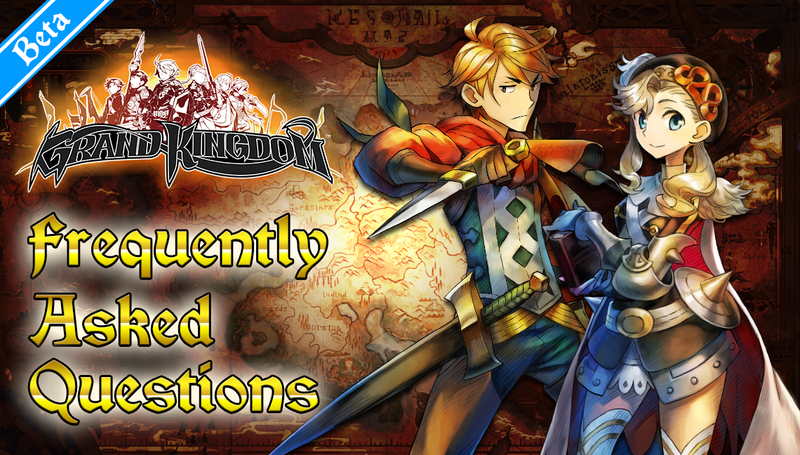 Grand Kingdom Beta FAQs | NIS America, Inc.
Help! I Have Questions About Grand Kingdom Beta! Hooray! Grand Kingdom beta is live! We’re so excited to see everyone playing and having a great time. Some questions have risen and we thought it’d be helpful to everyone to answer them all in one convenient place. If Grand Kingdom is coming out on the PS4 and PS Vita, can I join the beta on either system? While the game will be cross-platform, the beta is only available on the PS4. Can I still sign up for the beta? Of course! Hop on over to the Grand Kingdom beta registration page and sign up now! When does the beta end? Grand Kingdom beta ends in the wee hours of the morning on May 10. Remember that the save data in your offline campaigns can carry over to the full game upon release! I am trying to stream Grand Kingdom beta, but every time I do, my PlayStation 4 pops up a blue block screen. What’s going on? In beta, only the online war scenario can be streamed from the PlayStation 4. You can't stream Campaign Quests (no story spoilers allowed, dood! ), but in the full game you can stream online wars and other types of quests, such as Single, Versus, and Travel Quests using the PlayStation 4 SharePlay feature! How come I see some people stream Grand Kingdom beta gameplay without any problems? The offline and online content of the beta may be streamed without interruptions if you use a game capture device. However, please do not spoil other players’ experience for this amazing game! Are there any other elements to Grand Kingdom other than online wars? Yes. Grand Kingdom beta only gives you a taste of the gameplay. The beta period showcases a section of the storyline and allows players to go online to play competitively with their friends’ mercenary squads. The full game will offer an expansive story mode and allow players to learn about the fascinating tale of Resonail and the four warring nations in addition to the online wars. We hope you enjoy the beta and look forward to the game’s release on June 21, dood!